AB's Test return: Who drops out? 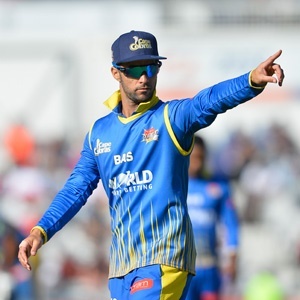 Cape Town - The Cape Cobras are oozing with confidence after three successive wins and their handling of critical pressure moments, admitted skipper JP Duminy. Duminy spoke after the hosts' 10-run win against the Warriors at a packed Boland Park fired them into the second place on the RAM SLAM T20 Challenge log. The Cape Cobras were able to recover well from their stuttering and are in a good position to host a home semi-final. "The second half of each innings is a huge improvement for us, as well as the way we produced in the power play without losing a wicket, were critical for us," said Duminy. The Warriors were still in a favourable position to chase down the Cape Cobras' score of 159 for four at the start of the 17th over. Dane Paterson nipped out 3-25, Ferisco Adams took 2-38 and the veteran Rory Kleinveldt, despite a slight injury concern, captured a marvellous 1-16. "If we focus ball by ball, game by game, we will give ourselves a chance towards the back-end of the T20 Challenge. We have to stay composed and grounded, but the wins have been confidence boosters," said Duminy. "We are still assessing the situation around the injury of Vernon Philander before Friday's match against the Dolphins in Durban. "It was a bit of a gamble to throw (George) Linde (in at No 3) to take things on, but it paid off. "He played exceptionally well. It was not just about hacking. He was very strategic (in his attacking approach while hammering 52 off 30 balls)," Duminy said. The Cobras managed 159 for four, thanks to contributions by Linde (52*) and Hashim Amla, who also struck 52 off 36 balls. Duminy brought Adams in the death and responded by taking the wicket of Colin Ackermann and Jerry Nqolo in one over to turn the game on its head. "Ferisco is renowned for his death bowling, with his exceptional skills-set and his variation and his accuracy with his Yorkers. It was not necessarily his best game, but this is the beauty of this game, you don’t always have to play your best game to get the job done," said Duminy. "It was the confidence we got out of the game. It was not necessarily our best, but we handled the pressure moments well and played exceptional in parts of the match. "Paterson showed the hunger and desire to come back and the way he performed was a confidence booster. It is good to see him at his best," Duminy remarked. An area in which the Cobras might still be a work in progress is the power play. If they can even be more destructive in that period, especially between the 6th and the 10th, they will be in a strong position to propel the visitors to a convincing win against the Dolphins. Play gets underway at 18:00 on Friday.